I really recommend these with the dates. 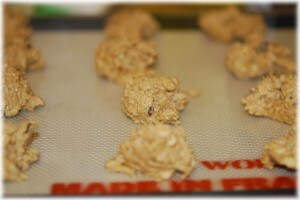 I had never had oatmeal cookies with dates before, and tried them, just as an experiment (I’ve always made these with golden raisins because I think the regular raisins tend to get bitter if you overcook them even a little). My hard to please taster said they were AWESOME! So, unless you just hate dates, try this, because although I didn’t taste them, (wheat flour!) my husband said they were wonderful. I’m going to make myself some of the rice flour ones with dates though, and see. Cream the sugars, shortening, butter, egg, water and vanilla together. Chop the dates up (remove the seeds). Add them to the flour and mix so they do not stick together in clumps (this is a good hint for any sticky dried fruits added to baked things–I learned it back when I used to make fruit cakes. And no not everyone hates fruit cake, I used to make an AWESOME fruit cake with lots of brandy, or was it rum, well, whatever it was awesome!). Add the salt and soda. Add all of this to the sugar/shortening mixture and mix well. Then combine with the Oatmeal until it is all combined. Preheat the oven to 350 degrees F. Drop these by teaspoon onto a cookie sheet that is either greased or covered with parchment paper or better yet a silicon mat. Bake about 12 minutes (be sure to check them as your oven’s temperature may differ). 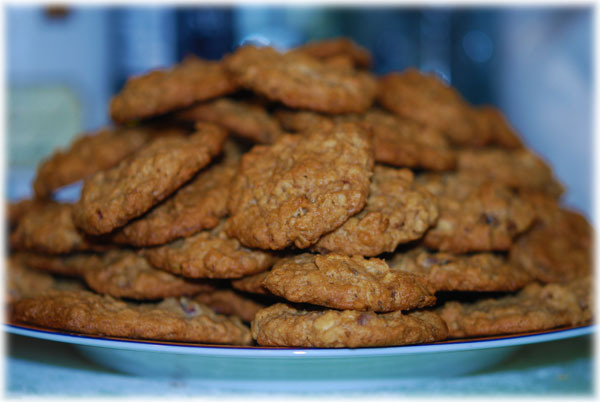 This recipe will make about 5 dozen cookies, but that will depend on the size you make. I meant to count them, but to be honest, they kept disappearing, so I didn’t get them counted! If someone makes them and counts them, please post the number!